On our final day, after watching lions and birds, we planned a “sundowner” drink at Nyamandlovu pan to end our safari in style. Before it was time for drinks, we got busy watching the many migratory birds present at the pan. These were a large flock of Abdim Storks and Amur falcons that provided us with much entertainment while they fed on beetles and other insects found in the grass. Abdim stork drying its wings. 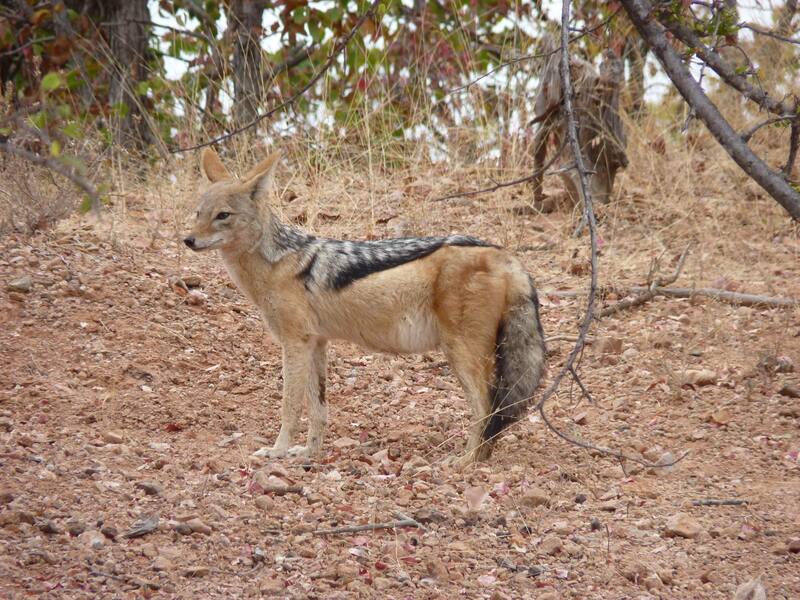 A family of five jackals, probably residents of the pan, were also around. While four of them were gnawing at an old elephant carcass, a fifth came close to the viewing platform for a look. As I was on the ground at the time I saw it coming and prepared for pictures. 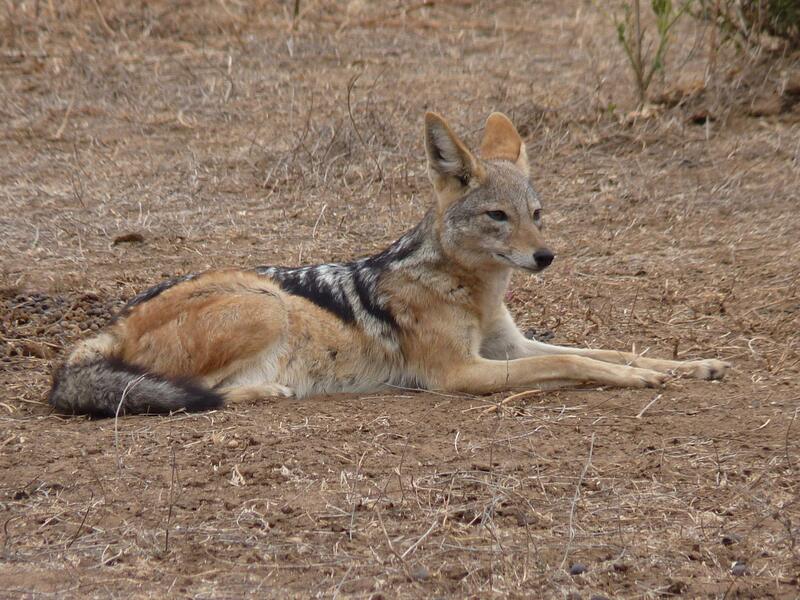 Despite the warnings shouted from above by fellow game watchers for me to be careful, I remained motionless and was rewarded with the closest encounter I have had with a black-backed jackal! 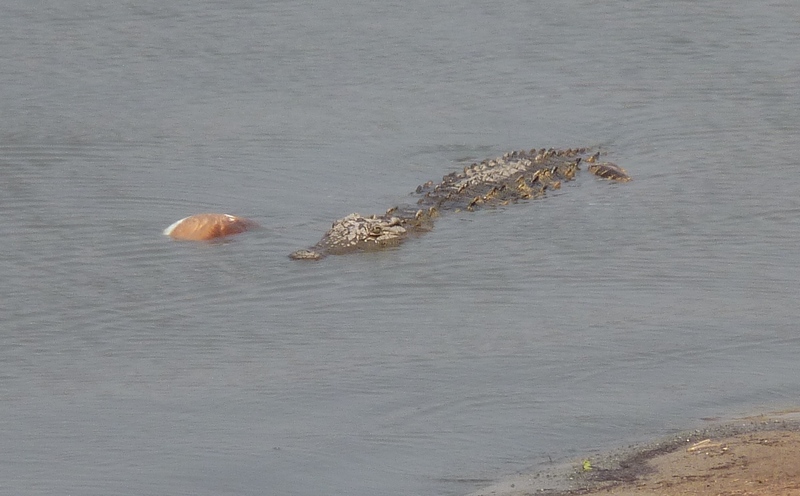 While watching the jackal I heard loud splashing noises coming from the pan and I saw a large crocodile (one of the three present) coming out of the water holding a very large chunk of carcass. I left the jackal to its business and rushed up the platform for a better look. The beast, at the left end of the pan, was violently shaking the carcass and scattering pieces in the water while it swam off with the remains to the opposite end. The crocodile feeding on the submerged carcass. The slow approach of a hippo to the area where the carcass had been shaken apart came as no surprise to my family and I, all well aware by now of our earlier observations on meat-eating hippos at Masuma dam! 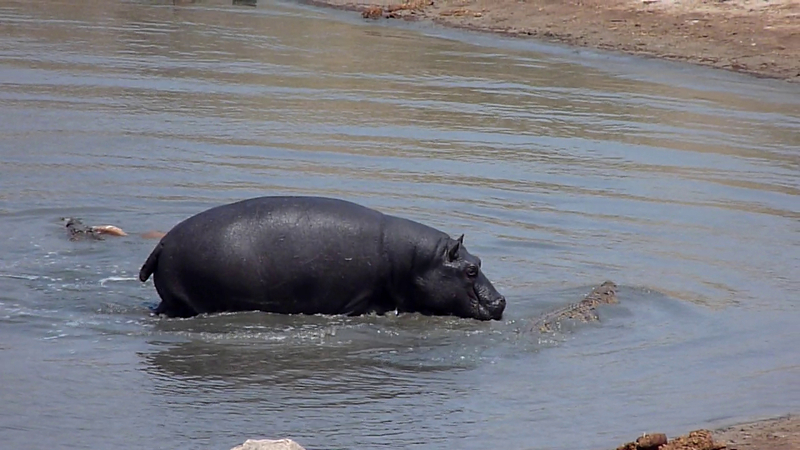 We watched while the hippo approached and searched the area with its head submerged. Suddenly it lifted its head and chewed on what appeared to be a piece of the carcass that it had found! 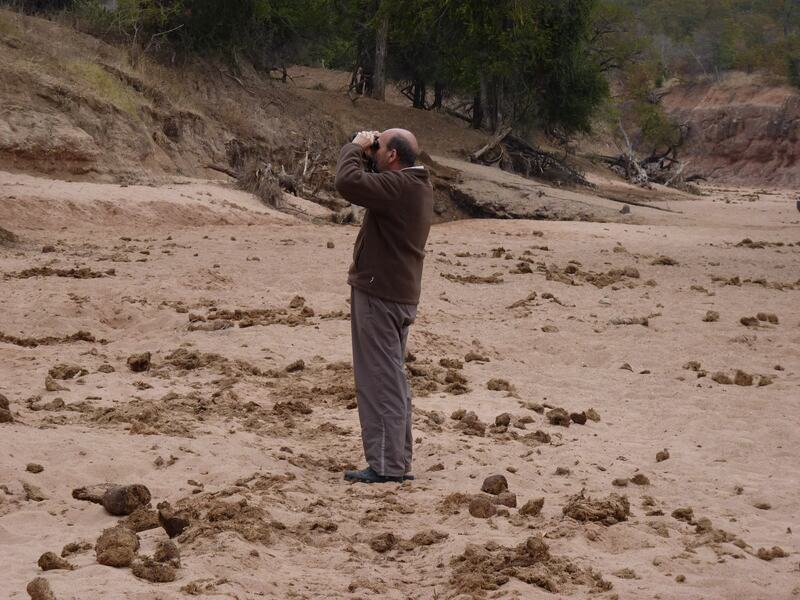 This was a very interesting observation, as we had not seen any of the three resident hippos engage in this activity before, despite having spent many hours there! Eating a chunk of the carcass that the crocodile left. After munching on its find, the hippo left the area jumping in the water in a rather funny display that probably expressed approval at what it had just eaten! Fortunately I managed to take a picture of the crocodile (regrettably only after the carcass shaking took place…) and of the hippo finishing its snack and merrily moving off! 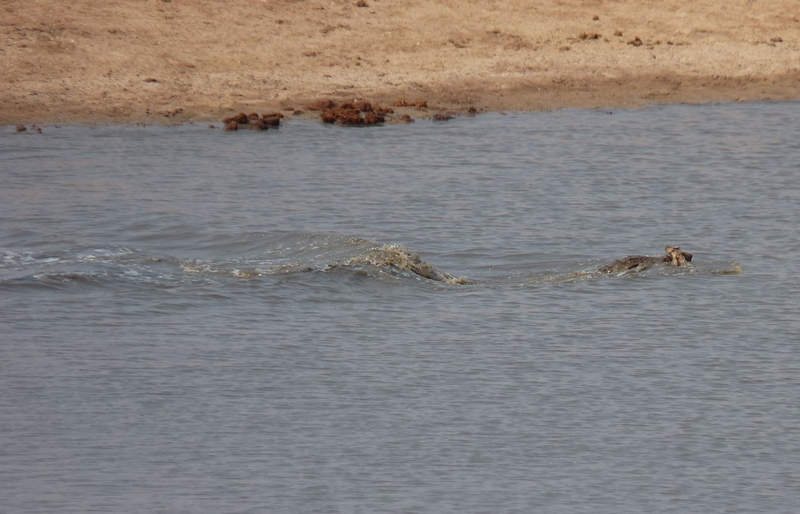 In an earlier post I described how Crocodiles were stalking and catching Impala at Masuma dam. What I did not mention yet was what happened next. You will not regret reading on! Masuma Dam is located in the Hwange National Park (18°43’52.20″S 26°16’47.82″E). The observations described here took place on 13/10/14 from 10.00 to 12.00 hours and on the 15/10/14 from 09.00 to 12.00 hours. The dam is about 120 by 100 metres and it has a roughly oval shape with the viewing platform located on one of the longer parts of the oval. A “panorama” view of Masuma Dam. 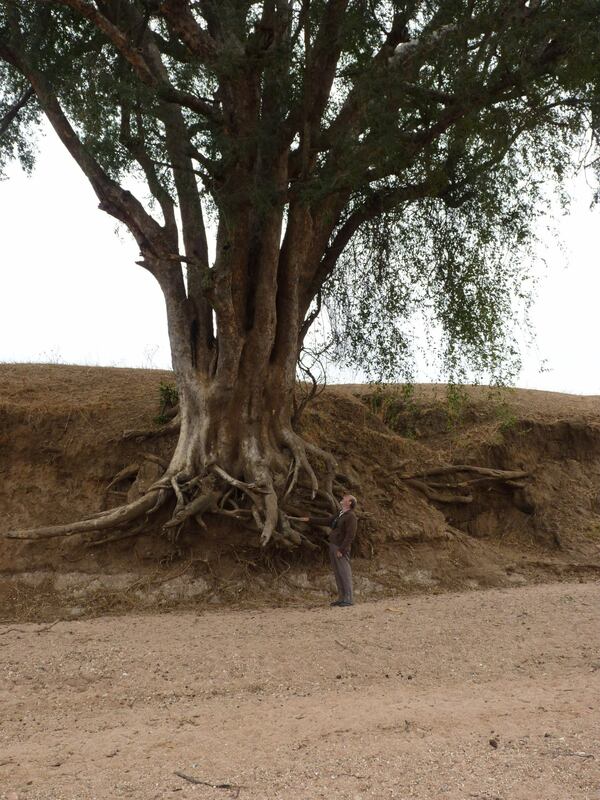 The time of the observations correspond to the end of the dry season. At this time of year many animals come regularly to drink at the dam. Apart from elephants, Greater Kudu, Waterbuck, Impala, Zebra and Warthogs were seen everyday. We also saw large flocks of guinea fowl, various doves, vultures, kites, buntings, starlings, among others. 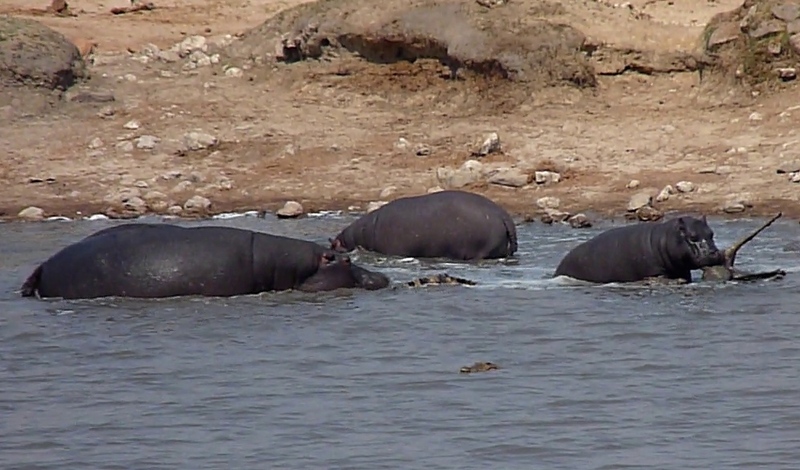 At the time there were sixteen resident Hippos, both adults and young animals as well as at least six mature Crocodiles. Map of Masuma Dam showing the various places mentioned in the text. 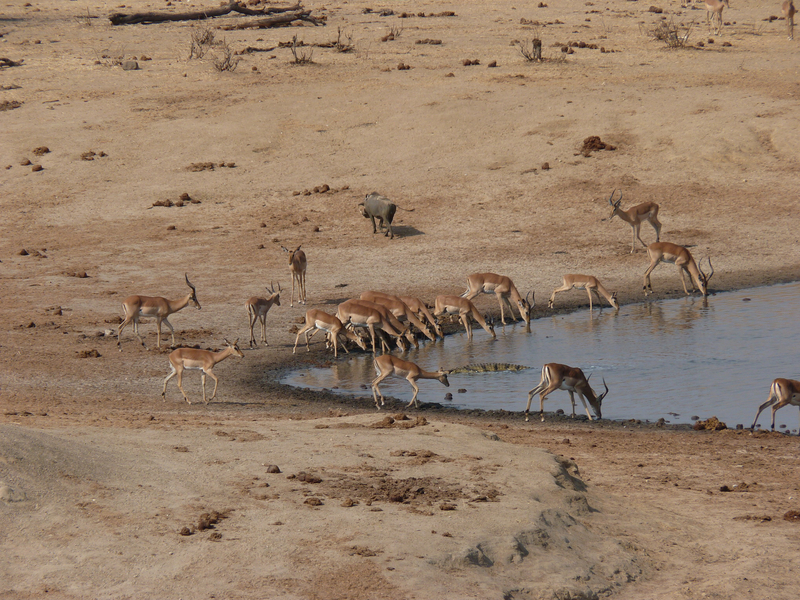 Impala herds drank mainly in the morning, mostly at Point 1 in the drawing. Aware of this daily event, Crocodiles were observed to ambush the Impala by positioning themselves across the small bay where the antelopes drank. Usually one of the Crocodiles would approach the Impalas in full view up to 1 to 1.5 metres from them. This created noticeable nervousness on the part of the Impala but they would gradually calm down and drink. The Crocodiles would remain immobile for a few minutes and then slowly sink and completely disappear. 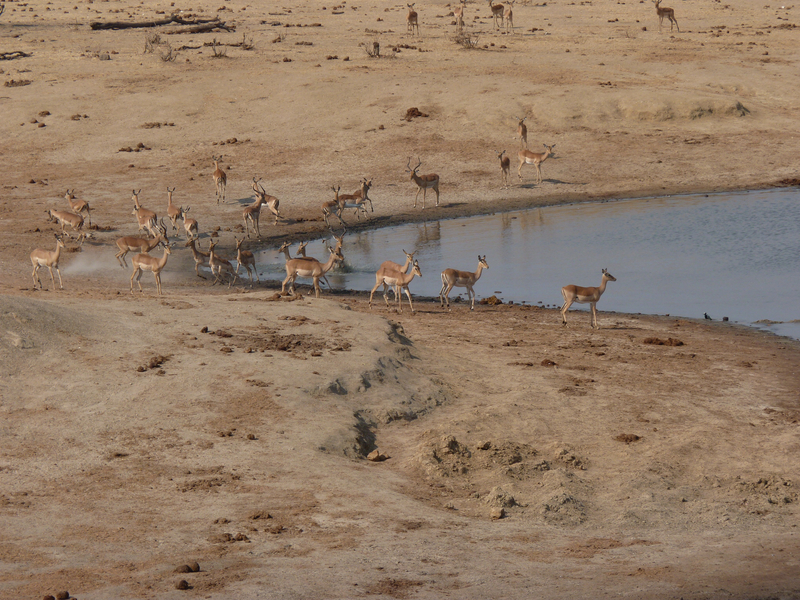 Most of the time, the Impala continued to drink and moved off and the reptiles remained quietly submerged. A Crocodile attack at the Impala drinking area. About two or three times in a morning, the hidden Crocodiles lunged towards the Impala. 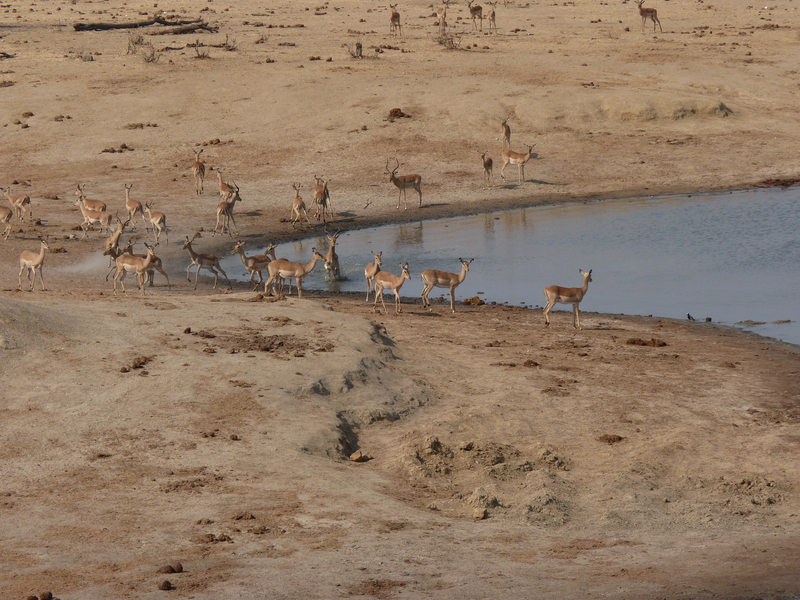 As soon as the swirl that precedes the attack was noted, the Impala scattered in all directions (including into the water!). The most common outcome was that the Crocodiles failed and went back to the water empty-jawed. On one occasion a young animal was caught from its leg and, after a short struggle, it was drowned. This happened only once out of 8-9 attacks we witnessed. 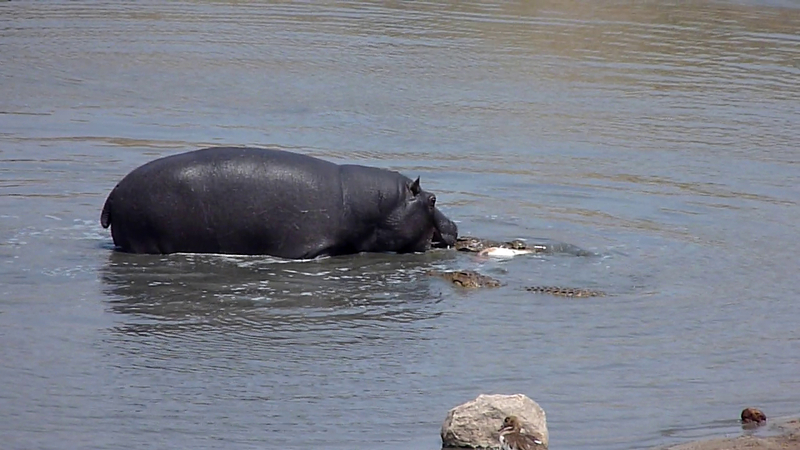 The Crocodile swims away with the freshly caught Impala just before it was chased by the Hippos for the first time. 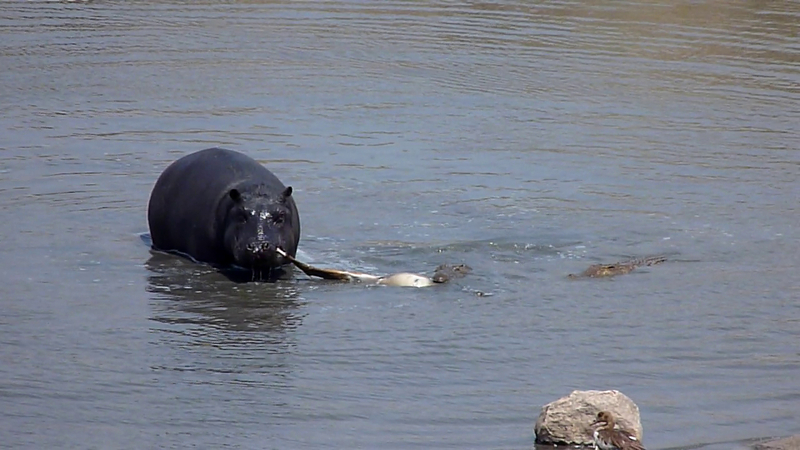 While the struggle between the Crocodile and the Impala was taking place, two Hippos approached the area and were seen chasing the Crocodile. 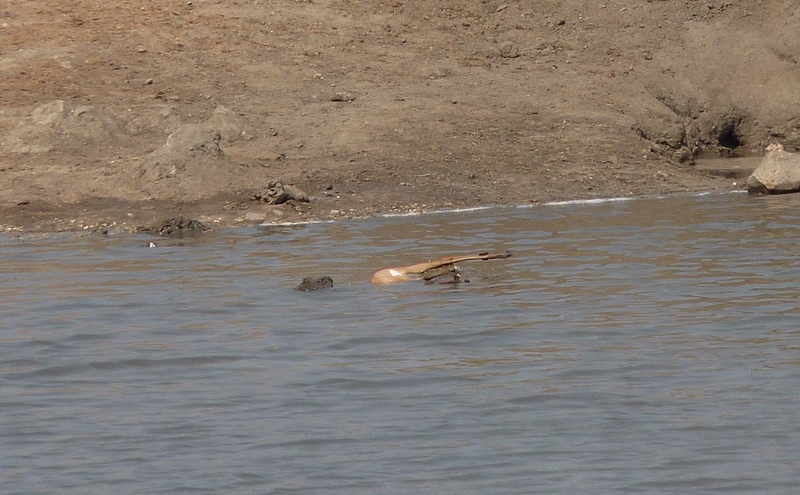 The latter submerged and took off while the Hippos lost interest and we speculated on their noble “rescue” attempt. The Crocodile with the Impala at Point 2. 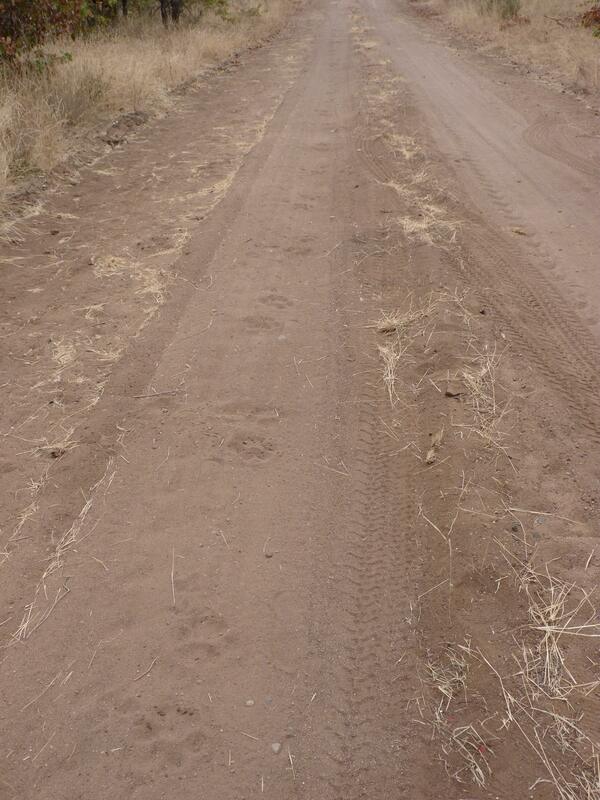 Ten minutes later the white belly and legs of the Impala came to the surface at Point 2 and caught our attention. A Crocodile held the dead antelope and others came to feed on it. 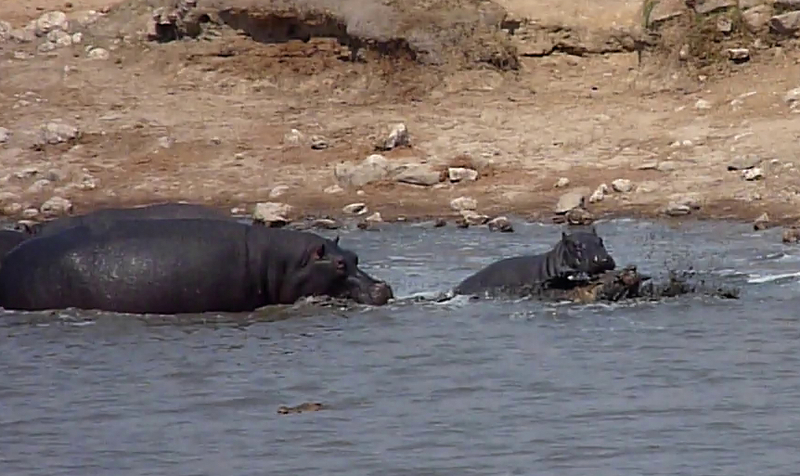 This, again, prompted a swift response from the Hippos, who came back and confronted them quite aggressively. The Hippos “rescue” attempt at Point 2. 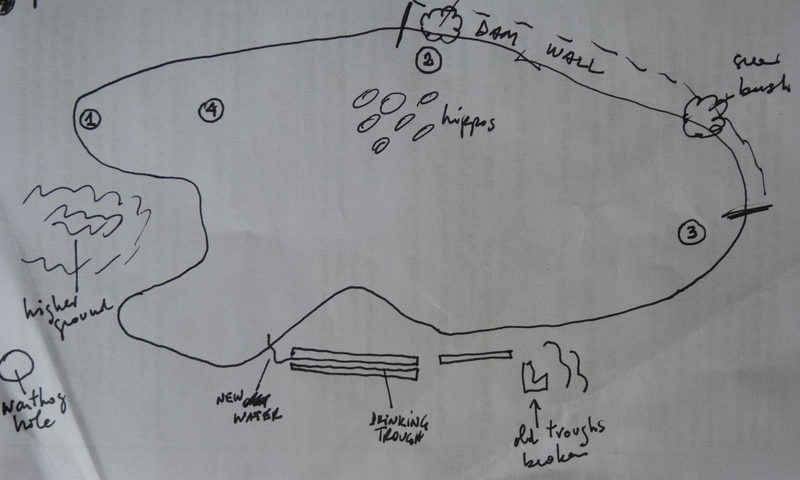 Another view of the Hippos’ “rescue” attempt at Point 2. The subsequent struggle involved a Hippo pulling from a leg while the Crocodile pulled from another part of the animal. 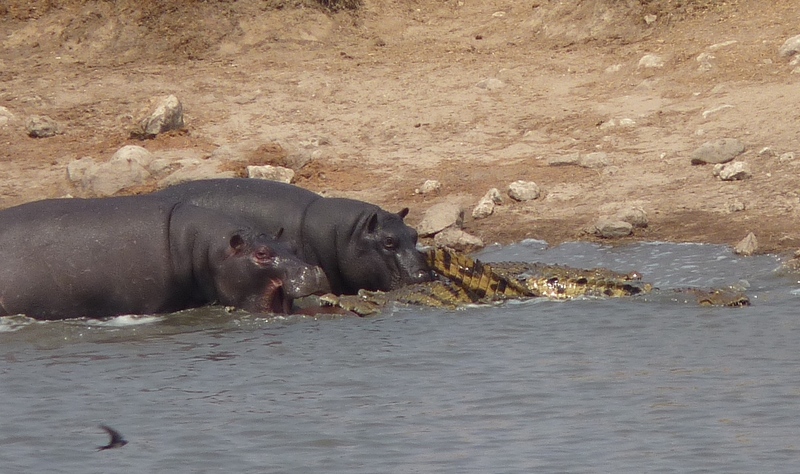 As the Hippo did not have a good grip on the leg (its teeth and mouth do not facilitate tug of wars), the Crocodile retained the Impala and, again, swam off with the carcass (or part of it as we could not see if it was split or broken up) towards Point 3 in the drawing. The Crocodile avoided the Hippos at Point 2 and moves to Point 3. The crocodile stayed at Point 3 for about 30 minutes with the Impala (or a large part of it) in its mouth until another Crocodile came and started to pull and tear at the carcass. In about a minute, a hitherto unseen/submerged Hippo burst into the middle of the tug forcing the Crocodiles to scamper again. A Hippo moves towards the Crocodile at Point 3. The Hippo tug of war with the Crocodile! The Hippo tries to bite the Crocodile. 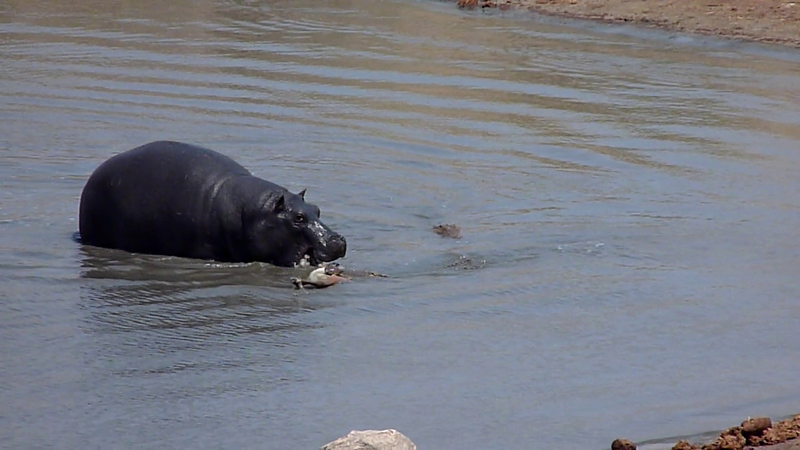 The Hippo chases a Crocodile while the other one escapes with the Impala towards Point 2. 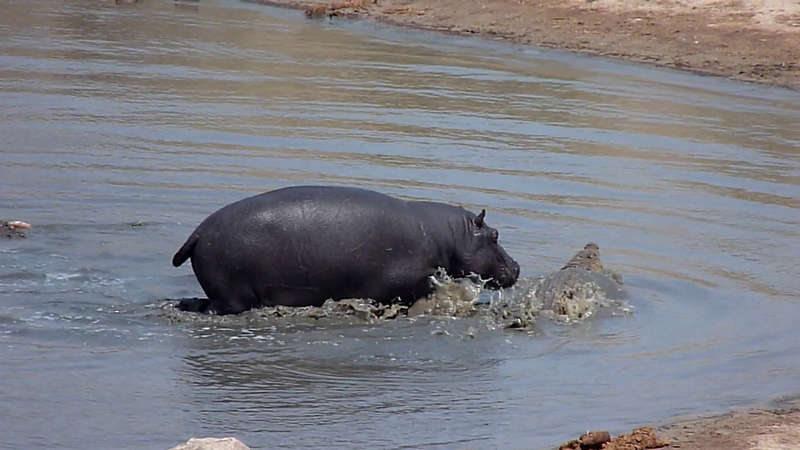 The Hippo keeps chasing the Crocodile while the other one swims away. While the Hippo chased one Crocodile the other one, still holding the carcass, swam back to Point 2 where it remained for another 10-15 minutes when, once more, its companions arrived and started to tear at the carcass. The Crocodile are attacked again after arriving at Point 2. Another view of the struggle for the Impala at Point 2. 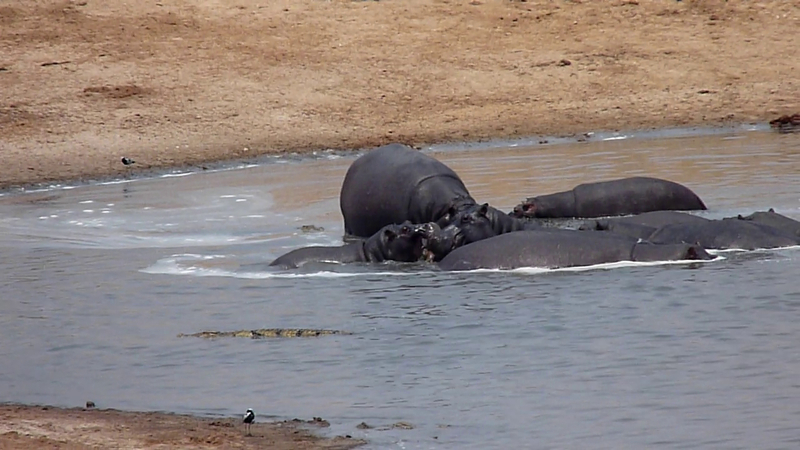 Another view of the Hippo vs. Crocodile struggle for the Impala at Point 2. 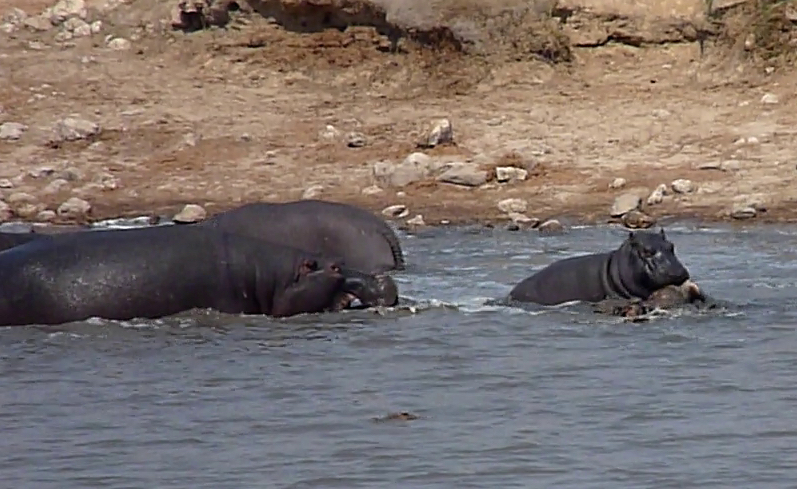 The Hippos came again and were seen clearly attacking the Crocodiles and even biting them. Calm was reinstated at the dam for about 20 minutes. 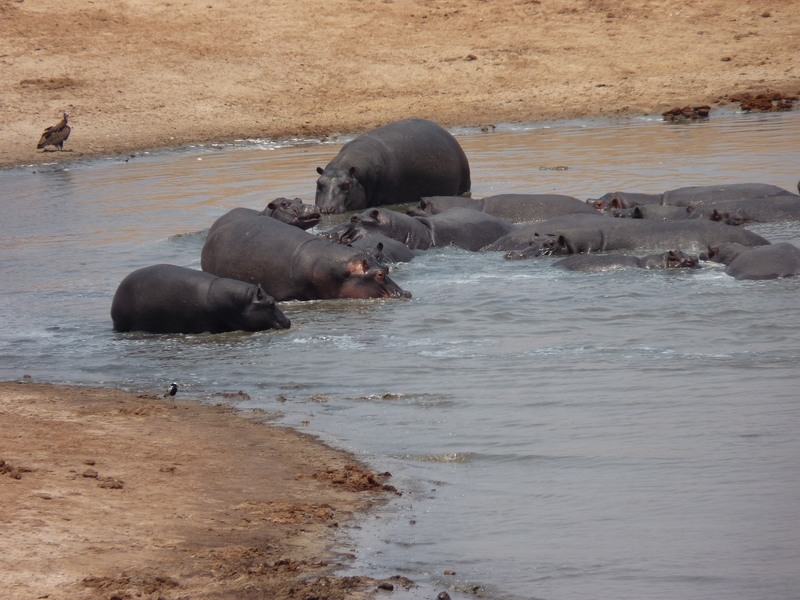 The next thing we noticed was a great commotion at Point 4 where the Hippos began to congregate. They were clearly competing for something and eventually several were seen apparently “mouthing” the Impala. 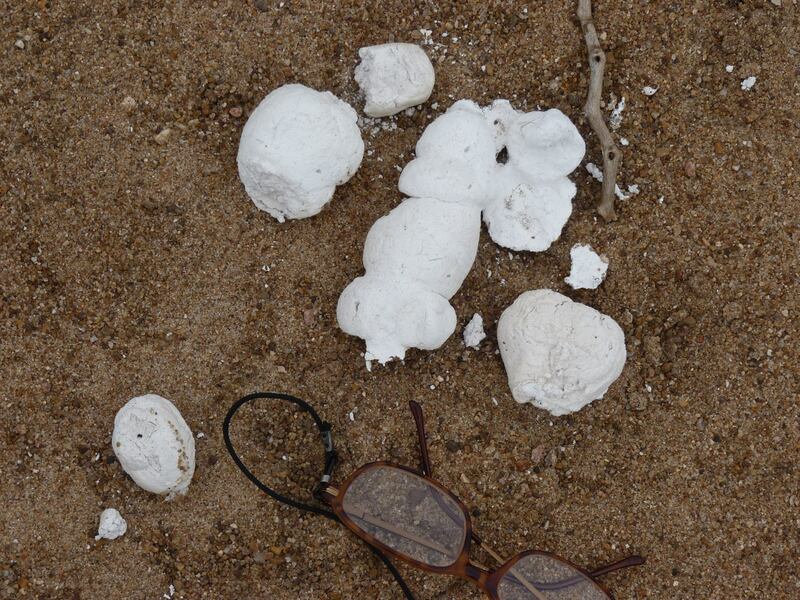 On closer observation they were actually chewing and apparently swallowing while bone-cracking noises were heard. 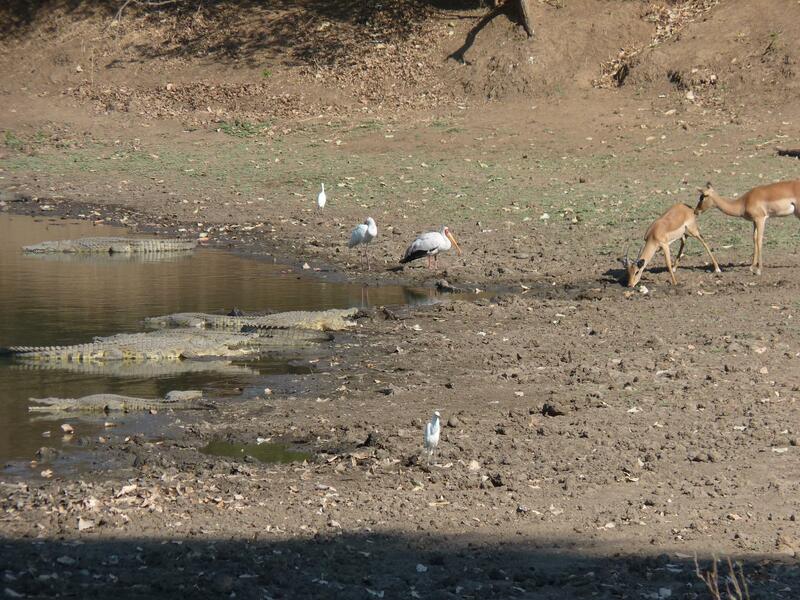 After snatching the Impala from the Crocodiles at Point 2, they congregate to feed on the Impala carcass. Another view of the final stages of the Hippo feeding frenzy. 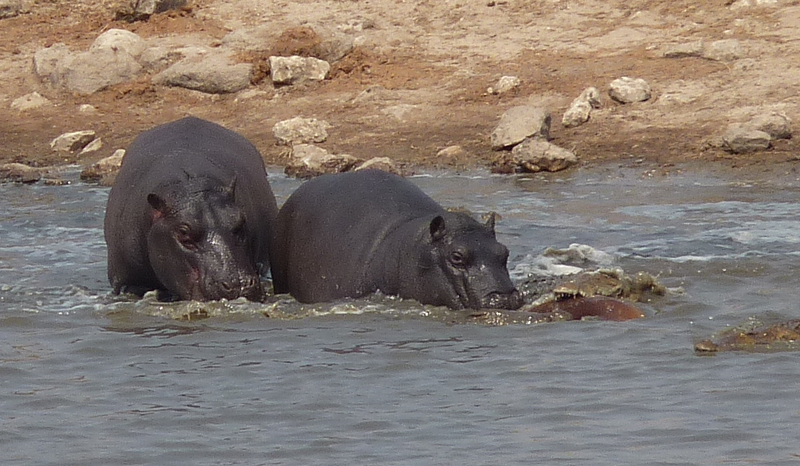 Unbelievably to us, at the time of these observations, the Hippos were eating the Impala! After it was consumed the Hippos went back to their normal place and peace returned. The moment they lost the carcass, the Crocodiles did not try to recover it. Confinement in the dam was the best possible explanation I could think at the time for such aberrant behaviour. The event appeared so unusual that, on arrival in Harare, I went straight to the computer to check the Internet. Not surprisingly, I found earlier references of similar incidents and the first report of carnivore behaviour in Hippos came from Masuma Dam! As, very recently the BBC and National Geographic have both published articles on hippo cannibalism I put together these observations to contribute to our general knowledge. I have also contacted Mr. Dudley and we are collaborating on the subject that may result in further work being published in the scientific literature. It was not easy to see the number of Crocodiles or Hippos involved in the various incidents described. I was excitedly filming the scene! Dudley, J.P. 1996. Record of carnivory, scavenging and predation for Hippopotamus amphibius in Hwange National Park, Zimbabwe. Mammalia 60 (3): 486-490. While on the issue of impala and crocodiles, covered in the earlier entry, I jump my post queue to show you what we observed in Mana Pools National Park last week. The Impalas had a serious dilemma! Luckily for them, they could drink from the small channels while the crocodiles could only watch and wish! 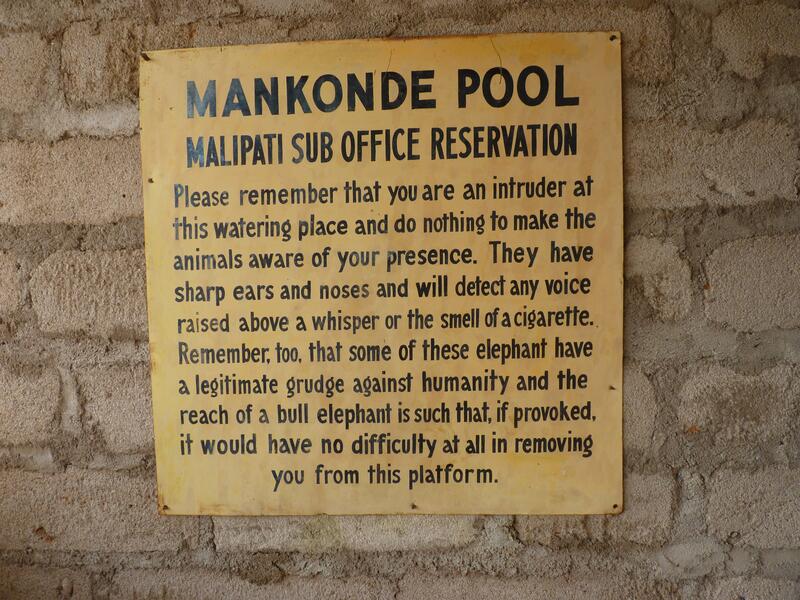 The events described were observed at Masuma Dam in the Hwange National Park. The dam is about 120m by 100m and it has a roughly oval shape. Water is continuously pumped to the dam from a nearby borehole making it an essential water source for the animal population in the surrounding area. 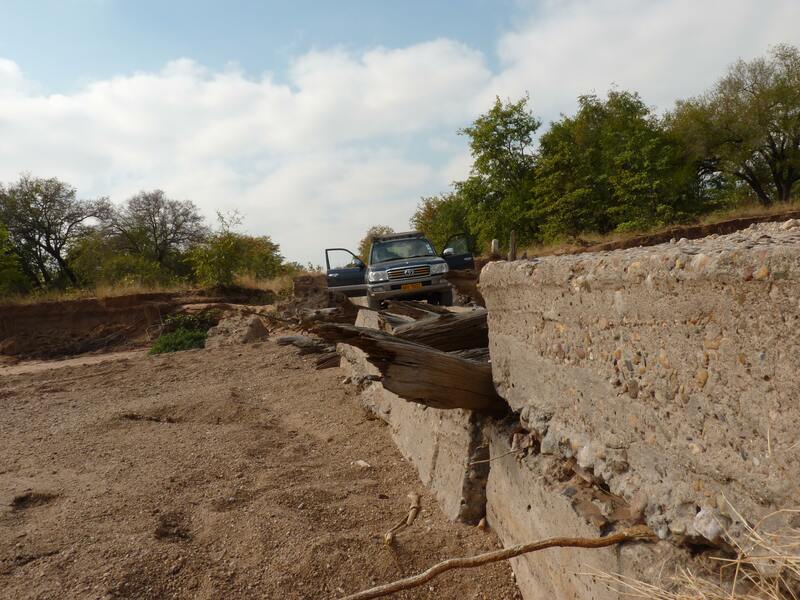 The time of the observations -13 to 16 October 2014- correspond to the end of the dry season. Elephants, Greater Kudus, Waterbucks, Impalas, Zebras and Warthogs were regular visitors, together with large flocks of Guinea Fowls and Vultures, to name the most frequent and common. We also counted 16 Hippos and six Crocodiles. 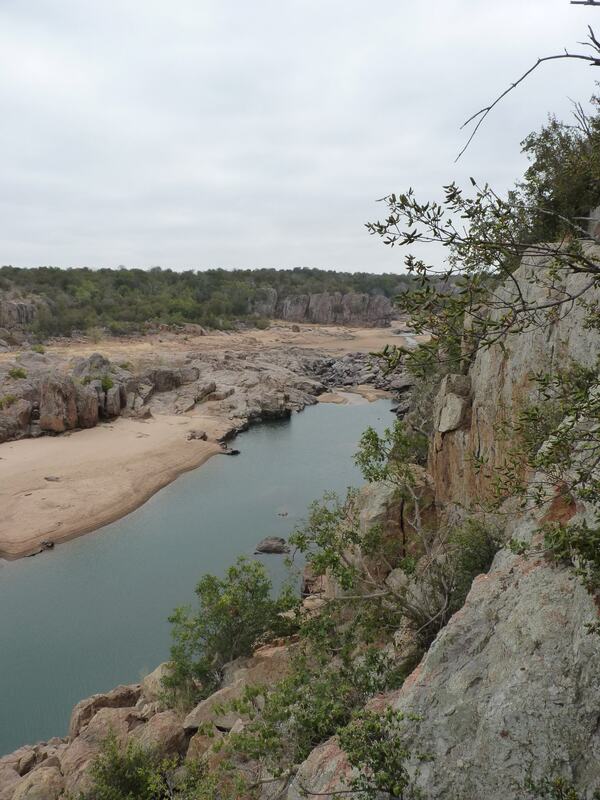 The preferred drinking place was a small bay located towards the Southern part of the dam (seen on the left of the picture above, at the back where some Impalas can also be seen). 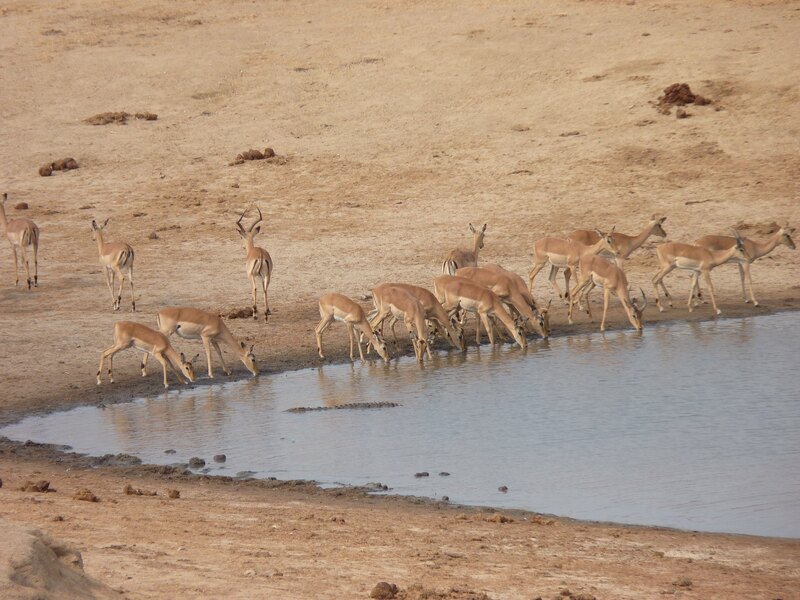 Most antelopes drank from there, particularly the Impalas that would come throughout the day in herds of various sizes. The figure below shows a typical drinking scene in that bay. 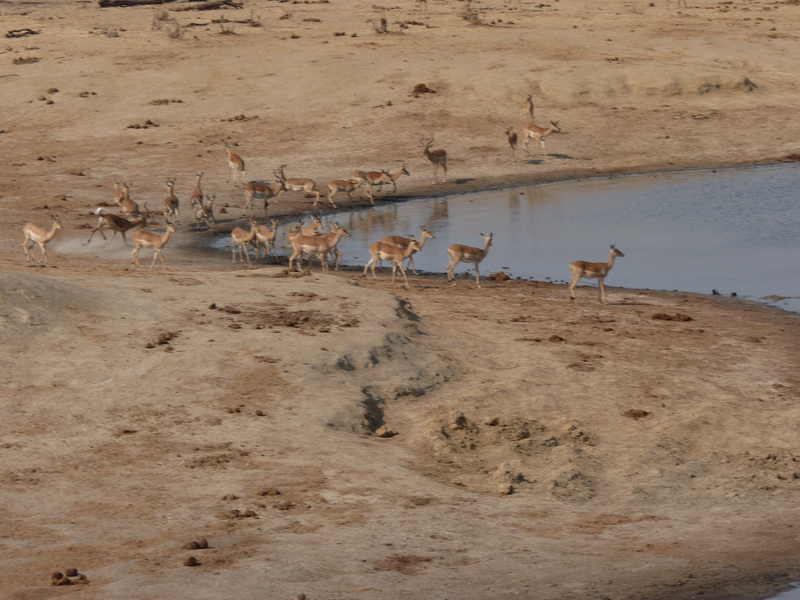 A herd of Impalas drinking at the dam. As soon as a herd started to drink, usually one of the Crocodiles would swim towards them. They did so in full view of the antelopes and stopped at about 1 to 1.5 metres from them. A crocodile slowly approaching the drinking Impalas. 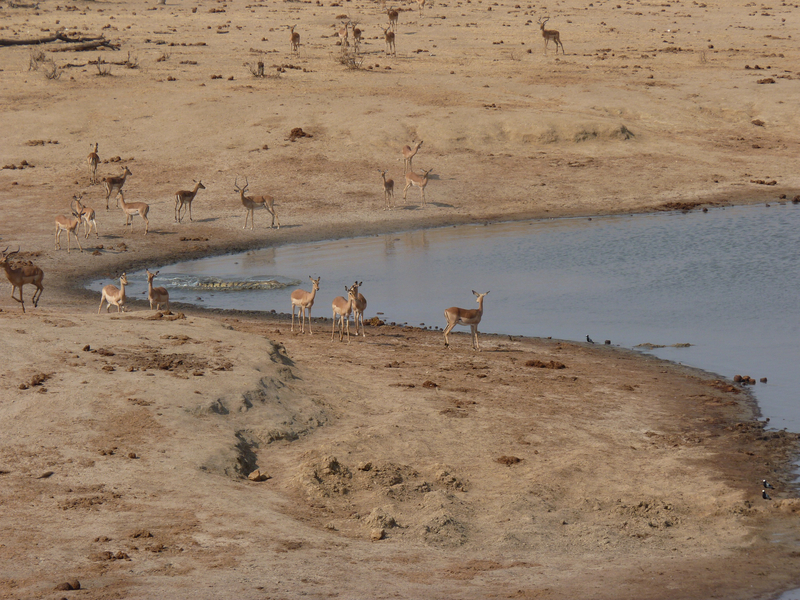 On seeing this the impala would withdraw from the water’s edge for a short time but gradually calm down and return to the water’s edge to resume their drinking. The crocodile would remain immobile for a few minutes and then slowly submerge and, eventually, disappear completely. The Crocodile starts to sink. The Crocodile is barely visible now and about to disappear. What followed next was really unpredictable. With the Crocodile (we assume that there is only one!) submerged the Impalas would continue to drink, although very fretfully. 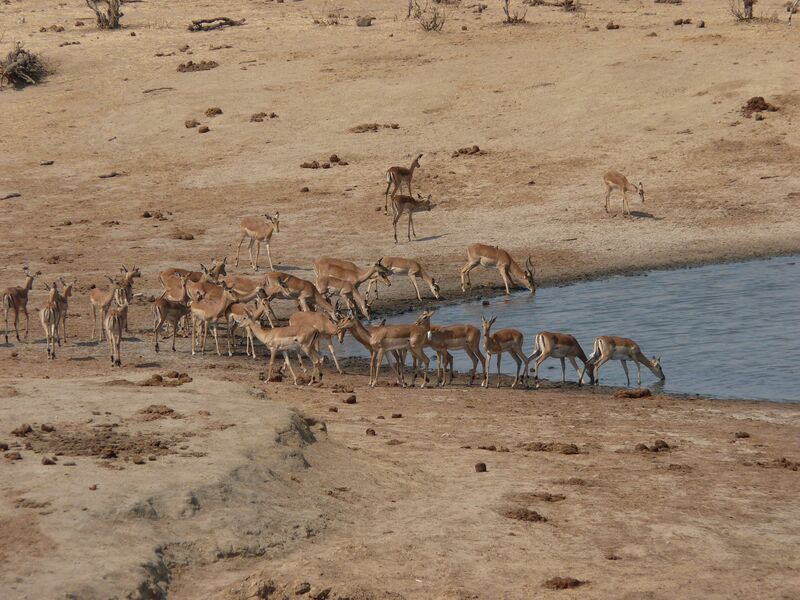 Most of the time, the Impalas will get their fill and move off without incident. However, approximately two or three times in a morning a sudden swirl in the water will be the only thing that preceded a violent attack by a Crocodile by lounging itself at the Impalas, moving its head sideways while biting in an attempt at catching one. 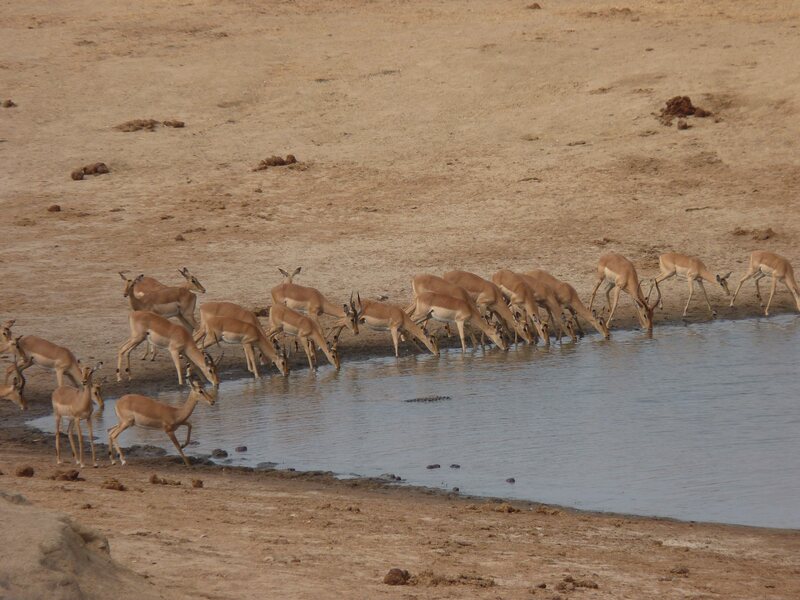 The Impalas’ first reaction at seeing the water starting to move. As soon as the impala saw the water movement preceding the attack, they scattered in all directions, including jumping into the water in order to avoid the Crocodile. The Crocodile attack is taking place, the Impalas scatter in all directions, including into the water becoming very vulnerable. 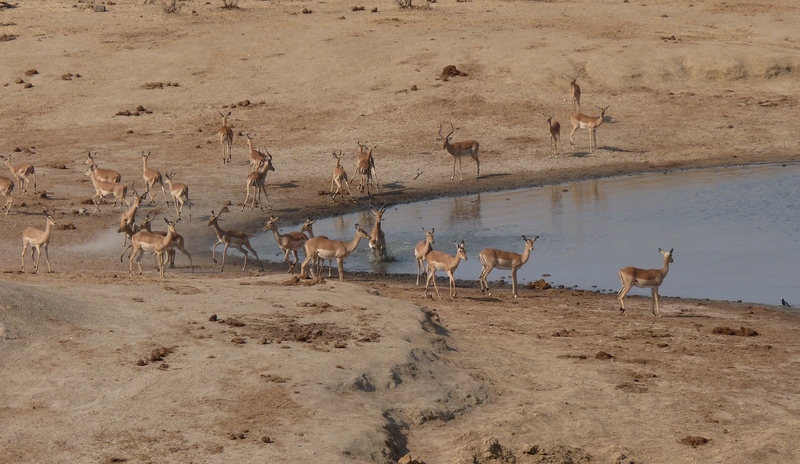 The Impalas escaped the attack this time, including the male inside the water. The most common outcome was that the crocodile(s) failed and went back to the water empty-jawed. The Crocodile returns to the water after the failed attack. On two occasions, however, animals were caught. 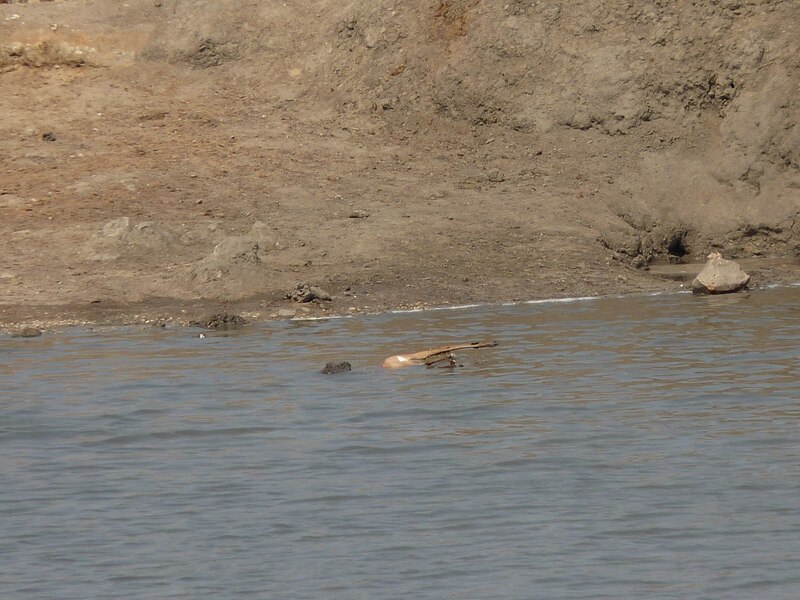 We witnessed one kill while the other one took place just before our arrival and saw the Crocodile swimming with the dead antelope. The Impala we saw was a young animal and it was caught from a foreleg. After a short struggle it was quickly drowned. 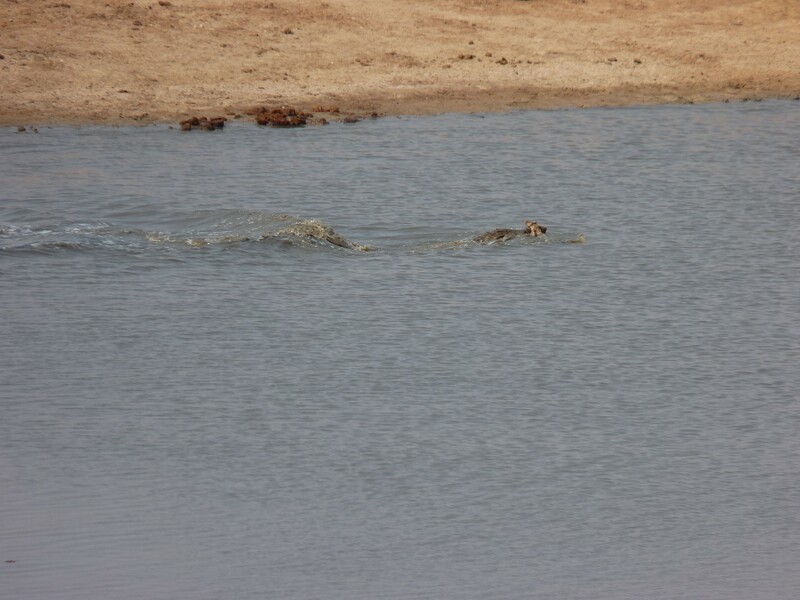 A Crocodile swims away carrying the Impala. The Crocodile holding the impala after drowning it. 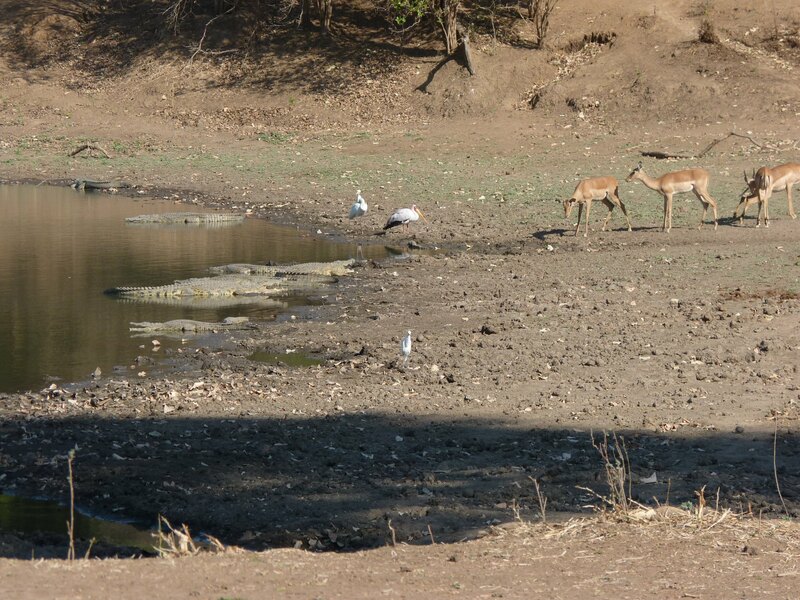 During the time we were at the dam, the Crocodiles caught two Impalas out of eight attacks witnessed. There was also an extremely interesting follow-up to the kills but for that you will need to wait for a while!! !